>I have a lover. She (yes, she!) is attentive, reliable, dependable. We’ve been meeting a few times a week for the last couple of months and quickly moved from a casual dalliance to a passionate, committed affair. When I touch her, she lights up, flashing her eagerness to be of use. My husband is fully aware of this passionate love affair, and he’s thrilled about it. My lover makes us both very, very happy. 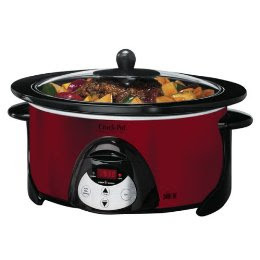 I’m having a love affair with my shiny, nickel-red slow cooker. My lover is an inanimate object, but that doesn’t make our relationship any less fulfilling. I could sing her praises all day long. My lover is a hard worker: she suffuses the house with succulent aromas that bring smiles to our faces when we come in from the cold. My lover is a magician: she transforms a quickly assembled mishmash of ingredients into a deeply flavored stew that melts in our mouths. My lover is budget conscious: one of her creations can be repurposed for multiple lunches and dinners in a week. My lover is low maintenance: just one touch of a button and she’s off and running, slow cooking away. And most importantly, my lover is cheap: I picked her up on a whim for $30. I’m not alone in my passion. Others have succumbed before me, and others will fall after me. Some, like the lovely Stephanie, have dedicated an entire year of their life to just crock pot cooking. I’m a shallow fickle lover. I know that I will desert my lover with the first hint of spring, but she can rest easy, she will have earned it. And next fall, when we wake for the first time to witness our lawn having been kissed by frost, I’ll fall head over heels in love with my slow cooker all over again. I scored this recipe from Amy, one of the moms in my local MOMS club group. It has an exotic sweet twist that will snap you out of the boredom of these winter months and will make you dream of faraway lands. it’s delicious, and virtually effortless, like most slow cooker dishes. Heat oil in skillet. Sprinkle both sides of the chuck roast with the salt and cumin. Brown the meat on both sides on very high heat. Remove from pan and put in a crock pot. Add onion, garlic, tomato juice, vinegar, olives and raisins to the crockpot and cook on high for 4 hours or on low for about 6 until meat is tender. Serve on a bed of couscous with the sauce and chunks of olives and raisins poured on top. Alternatively, you can take a couple of cups of the juice and “chunkies” and puree in a blender for a smoother sauce. ← >Quaker CrEATe Your Day Giveaway: What’s YOUR Dream Oatmeal Bowl? >I love my crockpot too. It's like having my own maid. In fact, I have Cuban black beans and ice cooking in mine right now. >Okay this reminds me I just saw the coolest idea on a blog the other day. The lady spray painted her crock pot with chalk board paint (it was a really ugly crock pot) and that way she could write on the side of the pot what was in it when she went to pot luck dinners. Isn't that a fabulous idea?